With Facebook, Twitter, Skype video, and so many other ways to keep in touch, the youth of our world is highly interconnected in a unified global community. Not surprisingly, ‘next generation’ Sidhas and Meditators around the world feel part of a common TM family, a Global Country of World Peace. Many of them share a keen desire to be together for an international Transcendental Meditation Teacher Training Course (TTC), and to remain connected and continue to support each other following the course. In response to these needs, the Global Country of World Peace is pleased to announce the next International Transcendental Meditation Teacher Training Course beginning September 2019. By mastering the ability to teach the Transcendental Meditation technique, you will learn how to effortlessly transform your students’ lives while accelerating your own spiritual development to enlightenment, contributing to the invincibility of the nation and lasting peace in the world. Two-year commitment after becoming a Teacher: Priority will be given to applicants who commit to work full time teaching the Transcendental Meditation technique for at least two years after completion of TTC. The two-year commitment will apply especially for those seeking scholarships. Age of applicants: For this special TTC, younger adults—including recent college graduates and young professionals from around the world—are especially encouraged to apply. However, all interested candidates are warmly welcome to apply. Language: The course lessons will be in English, but if there is sufficient interest from other language groups, we will work to arrange for translation into other languages. Regardless of skill in English, all interested applicants are encouraged to register their interest by applying. Note that all participants will learn to teach Transcendental Meditation in their mother tongue. Health insurance: Course participants are required to have health insurance that covers them in the course location. The 2019 Teacher Training Course will begin on 8 September 2019 (arrival date) and continue in residence, full time, until 17 February 2020 (departure date). Men’s and ladies’ courses will be held concurrently in Chanthaburi at separate locations with no interaction between the courses. This will allow maximum focus on the acquisition of the beautiful knowledge that Maharishi structured for the Transcendental Meditation Teacher Training Course. Rajapark Institute Training Centre, Chanthaburi, Thailand, is set amidst 50 hectares (124 acres) of beautiful orchard and natural bush with easy walking trails. 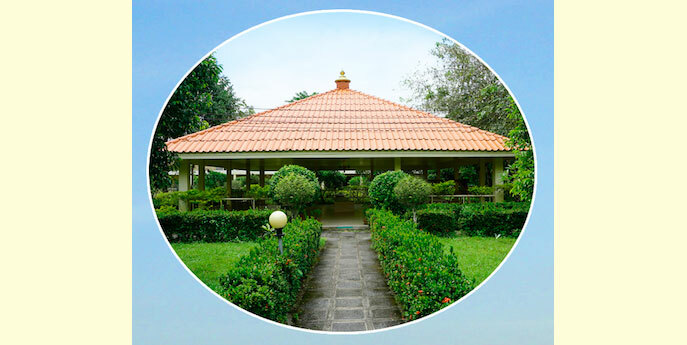 This unique campus, designed and built according to Maharishi Sthapatya Veda, saturated for many years with the peaceful atmosphere of Mother Divine, has four buildings around a central pavilion. Newly renovated, single-occupancy en-suite bedrooms, comfortable and spacious lecture and programme halls, and nourishing vegetarian meals will allow for a smooth experience of the daily TTC routine. Come join us in Thailand, where you will easily and comfortably absorb Maharishi’s exquisite knowledge of how to ‘whisper the supreme knowledge of life’ in our new renovated Maharishi Sthapatya Veda home for TTC. The course fee is US$19,500 including tuition and full room and board for the length of the course. Scholarships will be available for candidates who are accepted to the course and demonstrate financial need. Scholarships will be available for candidates who are accepted to the course and demonstrate financial need. Details on how to apply for scholarships will be found in the online TTC Application. Expenses for all transportation, visas, health insurance, and other incidentals are the responsibility of each course participant. Please click the following link to take the first step—complete the pre-application registration on line. For TTC 2019 applicants will complete pre TTC study at home before acceptance to the course. For this reason it is important to apply early in order to learn material to meet the TTC acceptance standards before 25 June 2019. All TTC Course Fees to be paid by 15 July 2019. All application details must be completed by the application closing date. Once you have completed the pre-application you will be notified how to proceed. We look forward to welcoming many participants to enjoy this course of Supreme Knowledge. Copyright © 2019 Maharishi Vedic University Ltd. All rights reserved worldwide.